What you're getting is a set of dovetail joints, a slide-off lid, and 12 cut-out shapes in four of the sides. 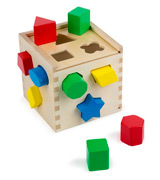 The aforementioned 12 shapes are made of natural and solid wood as well, but the blocks are brightly coloured, featuring just the right size for any child above the age of 2 to grab one of these parts and drop them in the shape sorting cube. Some shapes are not perfectly smooth. There are a lot of options out there, but if you're looking for a toy that will be able to greatly improve your little one's problem-solving skills as well as develop the kid's shape and colour recognition, Melissa &Doug Shape Sorting Cube is about as good as building blocks for kids get. 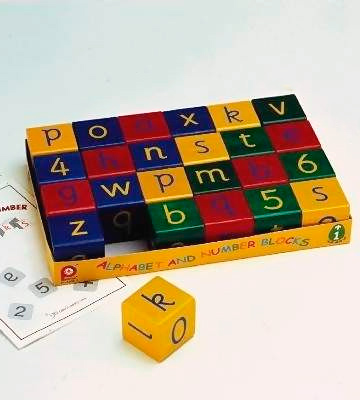 The blocks are illustrated with the letters of the alphabet in lower case, numbers 1-10, and arithmetical signs. Since there are only 24 cubes, each side of it is printed with a number and a lower case letter. Aside from that, the font is easily recognisable and the blocks are quite chunky, making them perfect for a toddler in terms of size as well as comprehension. You will have to acquire a box for containing all of these pieces separately. If your child has only recently reached the milestone of 12 months or he is just approaching this age, Pintoy Wooden Alphabet and Number Blocks is exactly what you ought to get him for his first birthday. The toy presents a fun way of learning numeracy and literacy from a very small age. What you receive is 100 sizable wooden building block, with each one of them offering a unique size, a particular shape, and a different colour, so your kid’s imagination will be able to run wild tying all of these pieces together into an elaborate structure and smashing all of them down after the process is complete and the little engineer is bored with his creation. Some elements might seem a bit small for a 5-year old. 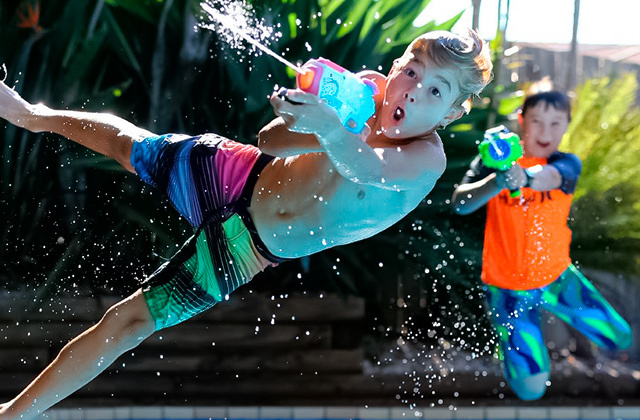 If your kid has long passed the age of infancy and it’s been years since you could honestly describe your little one as a toddler, it is high time for you to purchase him a proper toy that will offer heaps of fun for him and his friends. You get 10 unique wooden pieces, each shaped and coloured as a specific animal, from an elephant and a zebra to a cow and a giraffe. Though each piece is unique, every one of them is carefully crafted and comprised of only high quality, responsibly sourced materials. The model provides a small lorry with holes made specifically for different animals. The cord gets a bit loose after some time. 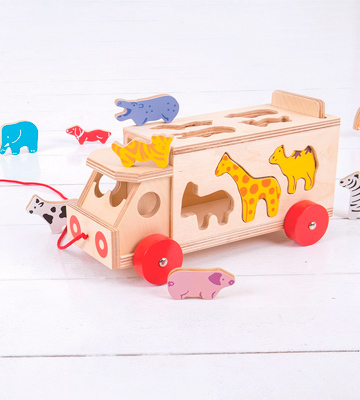 It would be hard to even imagine a toy that could accomplish the task of developing dexterity and colour recognition as well as providing a source for imaginative play with the same effortless elegance as Bigjigs Toys Animal Shape Lorry. This toy will allow children to join and recognise images in three dimensions, as well as transform these wooden blocks into a variety of forms. 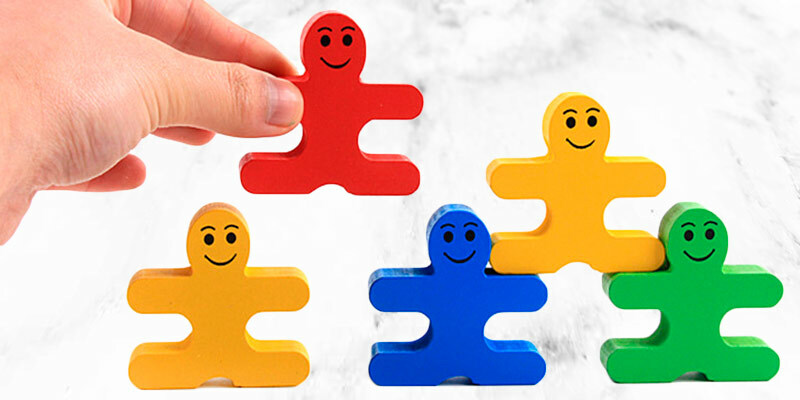 Aside from obviously increasing the kid’s motor and construction skills, this model will also prove to be incredibly useful in terms of developing their social intelligence while playing in a group. Separating the pieces requires a certain amount of effort. If you’re looking for a unique and versatile toy that will be able to accommodate a single kid above the age of 3 as well as a group of children, not to mention present a fun little challenge to any adult, Colleer Building Blocks might just be the kind of model worth looking into. Melissa & Doug Shape Sorting Cube is a kind of wooden block puzzle that doesn't necessarily stray away from the classic and orthodox approach but also isn't reluctant to implement some of the newer ideas in educational toys. The basis of it is a simple yet elegantly crafted structure that is comprised of smooth, natural wood. Along with this basis, what you're getting is a set of dovetail joints, a slide-off lid, and 12 cut-out shapes in four of the sides. 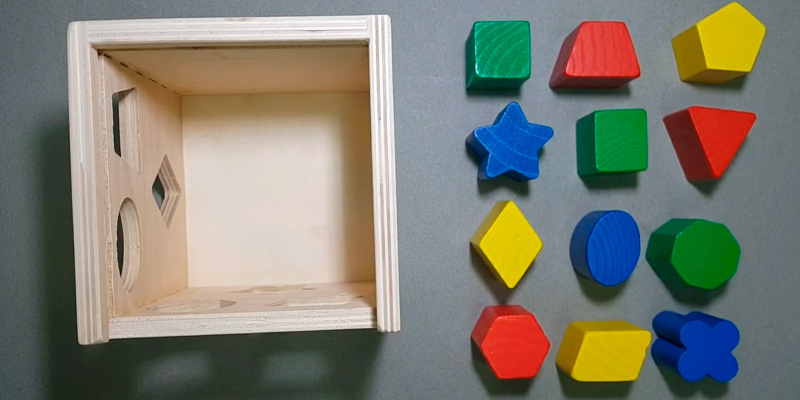 The aforementioned 12 shapes are made of natural and solid wood as well, but the blocks are brightly coloured, featuring just the right size for any child above the age of 2 to grab one of these parts and drop them in the shape sorting cube. As you can see, the sturdy wooden construction implements different shapes that will only let blocks of the same form fit through the hole. 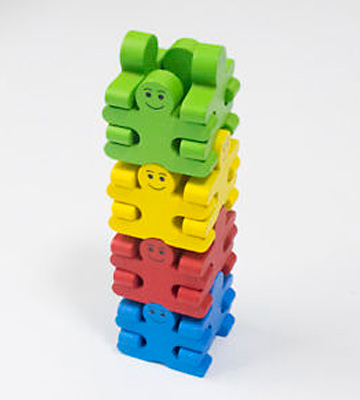 And since each block isn't just different in terms of shape but also colour, the toy will promote shape recognition just as well as colour recognition. Aside from that, this model from the series of Melissa and Doug puzzles will also be instrumental in terms of developing and improving your little one's problem-solving skills since he or she will have to figure out all of the elements that go into this game, not to mention the hand-eye coordination and dexterity required to fit all of the pieces exactly where they're supposed to go. And if that isn't enough, the manufacturer also added an illustrated guide that features all of the names of the shapes, meaning this product will be able to serve an educational purpose, among other things. So, if you're looking for a toy that will be able to greatly improve your little one's problem-solving skills as well as develop the kid's shape and colour recognition, Melissa &Doug Shape Sorting Cube is about as good as building blocks for kids get. 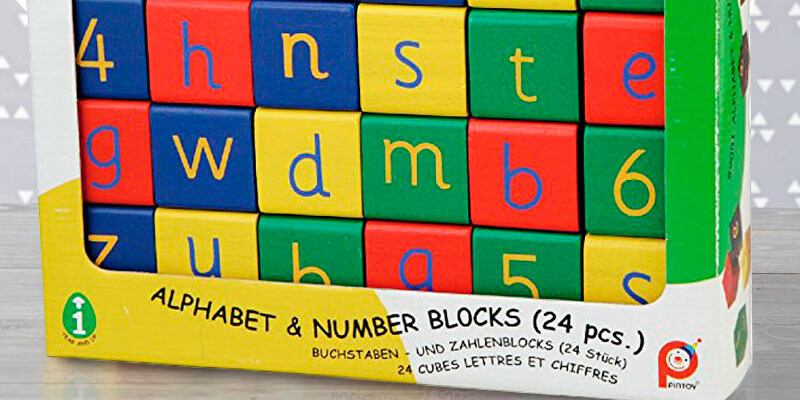 With educational toys, there are quite a few things you ought to look out for and we will be hard-pressed to find a better example than Pintoy Wooden Alphabet and Number Blocks to demonstrate how all of these things should be put together and implemented. The model in question doesn’t present its customers with any unnecessary features and everything that is included in the box has its specific purpose. Now, without beating too much around the bush, the toy is essentially a set of 24 coloured wooden bricks made of solid timber and coated with non-toxic paint. The blocks are illustrated with the letters of the alphabet in lower case, numbers 1-10, and arithmetical signs. Since there are only 24 cubes, each side of it is printed with a number and a lower case letter. Aside from that, we would also like to point out that the font is easily recognisable and the blocks are quite chunky, making them perfect for a toddler in terms of size as well as comprehension. 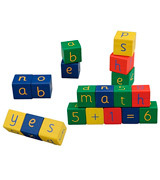 Furthermore, since what we have here is an educational toy first and foremost, we would be remiss not to mention that these wooden letter blocks will serve as a perfect tool to encourage learning numeracy and literacy from a very small age. 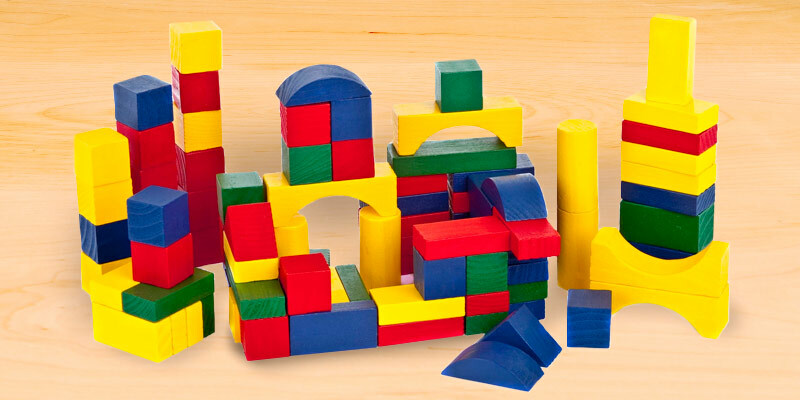 And given that this is still a toy, any toddler will be able to have lots of fun building small structures with these wooden blocks and knocking them down afterward. You won’t even have to worry about your little student somehow injuring himself in the process thanks to the use of rubberwood, which, among other things, is also one of the most environmentally friendly materials. So, if your child has only recently reached the milestone of 12 months or he is just approaching this age, Pintoy Wooden Alphabet and Number Blocks is exactly what you ought to get him for his first birthday. The toy presents a fun way of learning numeracy and literacy from a very small age. Every toy has its purpose and a specific target audience. If your child has long passed the toddler and the preschool stage and is already on his way to becoming a proper grade-schooler, neither a small set of uninspiring cubes nor an educational toy aimed towards learning the absolute basics of math and literacy simply won’t be able to suffice. A kid this age requires a proper toy and this is exactly what Marionette from URBN Toys is here to offer you. What you will receive in exchange for a fairly modest price is a set of 100 sizable wooden building blocks. An impressive number in its own right, each cube offers a distinctive size (though all of them are chunky enough for a 5-year-old to enjoy), a particular shape, and a different colour, so your kid’s imagination will be able to run wild tying all of these pieces together into an elaborate structure and smashing all of them down after the process is complete and the little engineer is bored with his creation. Though the toy will definitely bring truckloads of enjoyment to any child, the model does not trail behind in terms of education either, building physical strength and improving eye-hand coordination. Just like any other set of wooden blocks, it might also help your grade-schooler with shape recognition, geometry, and creative thinking. On top of that, given the size and the number of pieces, this set will also encourage even the most modest and timid kids to make friends in order to cooperate with them. After the kids are done playing with this toy, they can put the whole thing into a fibre tin that comes with a convenient handle for easy transportation. 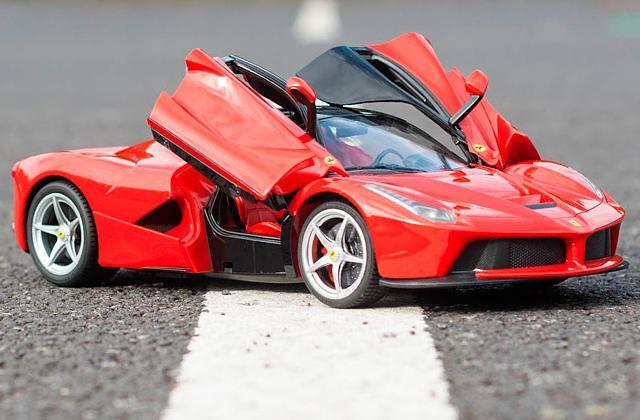 So, if your kid has long passed the age of infancy and it’s been years since you could honestly describe your little one as a toddler, it is high time for you to purchase him a proper toy that will offer heaps of fun for him and his friends. 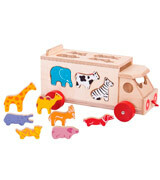 BigjigsToys Animal Shape Lorry is quite dissimilar to the majority of wooden blocks out there. In fact, this isn’t even necessarily a set of wooden blocks and more of a wooden shape sorter in a form of a small truck that offers a variety of unique advantages when compared to a simple package of similar wooden pieces. 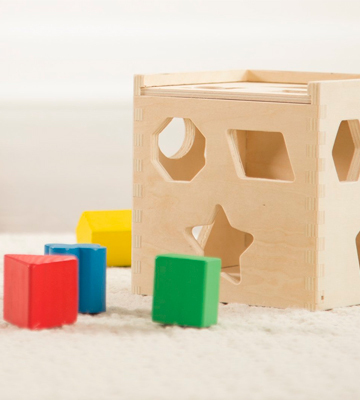 While the majority of wooden block sets can offer a fairly limited array of benefits in terms of education due to the shape and the structure of the cubes, this model offers two toys for the price of one. First off, you get 10 unique wooden pieces, each shaped and coloured as a specific animal, from an elephant and a zebra to a cow and a giraffe. Though each piece is unique, every one of them is carefully crafted and comprised of only high quality, responsibly sourced materials. As you would imagine, this set encourages imaginative play and gets your little explorer acquainted with a variety of different animals. But that is only the half of what this toy has to offer. Once the kid is familiar with all of these animals, the model provides a small lorry with holes made specifically for different animals. The kid’s goal is to load all of these animals into the truck through these specific slots. After your little bus driver is done with that task, all he has to do is close the rear tailgate and take these cute animals on a journey with him. The lorry comes equipped with a handy red cord that will allow your kid to drag this compact truck along with him. All in all, it would be hard to even imagine a toy that could accomplish the task of developing dexterity and colour recognition as well as providing a source for imaginative play with the same effortless elegance as Bigjigs Toys Animal Shape Lorry. 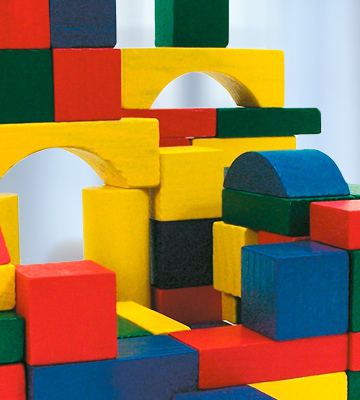 BuildingBlocks from Colleer is another example of educational toys that combine the advantages of a standard set of wooden blocks with their very own unique approach that integrates seamless education into the process of fun and recreation. 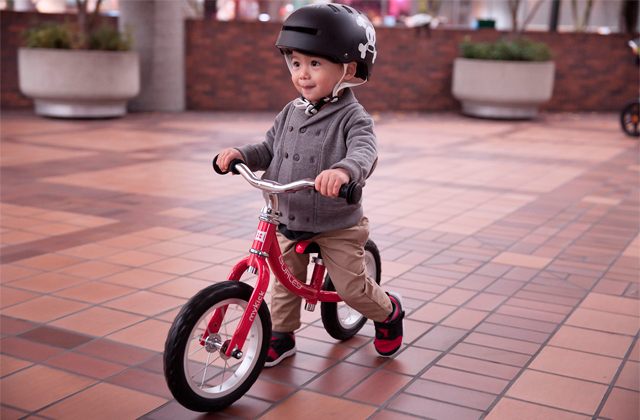 This one will be perfect for preschoolers that are just advancing from the toddler age. As you are probably aware, this period is synonymous with tremendous intellectual, social, and emotional changes, which is why you should get a toy that will be able to accommodate and further this progress. 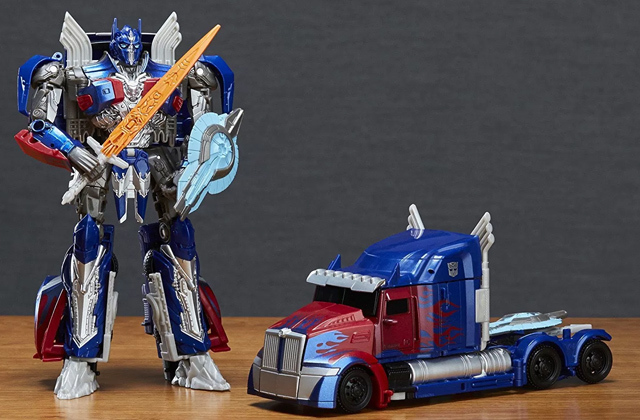 Naturally, just proclaiming that the toy will be perfect for a specific age group shouldn't enough to convince anyone to purchase this product, though there are quite a few elements that ought to be able to do the trick. 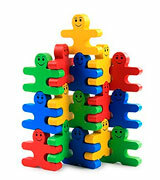 To start with, the toy comes equipped with 16 identically shaped pieces that come in 4 different colours. 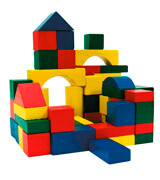 Given their unique design, any kid above the age of 3 will be able to build a plethora of distinctive constructions. Other than a great source of entertainment, this toy will also allow children to join and recognise images in three dimensions, as well as transform these wooden blocks into a variety of forms. 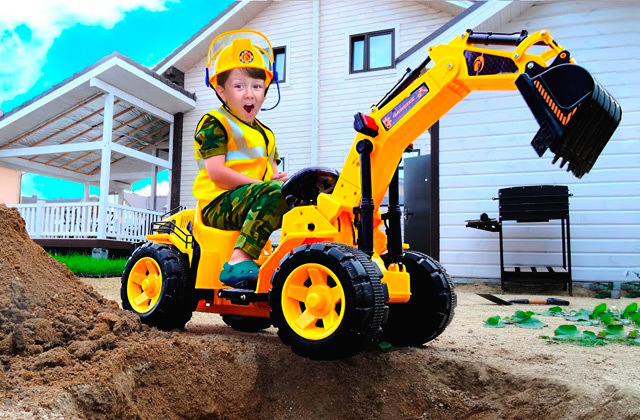 Aside from obviously increasing the kid’s motor and construction skills, this model will also prove to be incredibly useful in terms of developing their social intelligence since its design is perfect for kids to play alone just as well as to have some fun in a group. Though its target audience is mostly children above the age of 3, any adult could easily enjoy this puzzle after a long and exhausting day at work. In conclusion, if you’re looking for a unique and versatile toy that will be able to accommodate a single kid above the age of 3 as well as a group of children, not to mention present a fun little challenge to any adult, Colleer Building Blocks might just be the kind of model worth looking into. We are all familiar with wooden blocks from the early childhood, but we rarely think why this toy is so popular. What can be simpler than a set of blocks? However, it allows kids to explore the world by creating something new with their own hands. It makes learning enjoyable! Playing with cubes promotes spatial thinking and improves fine motor skills, helps to understand math. Moreover, building with wooden blocks will stimulate your child's imagination, creative thinking, and problem-solving skills. Today, manufacturers provide their toys with new shapes and features to make the game even more delightful and captivating. 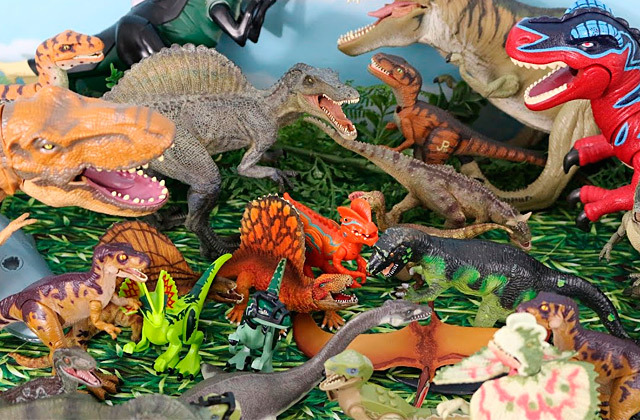 Each model in our review is special, and we hope that you will find the set (or sets), that your kid will love! Most of these sets are suitable for toddlers. If you are looking for a tool to enhance a newborn's motor skills, get a baby gym that will let your sweetie learn with pleasure. One more unique invention is a mobile, a perfect toy to keep your baby occupied, or lull him/her to sleep. 1. 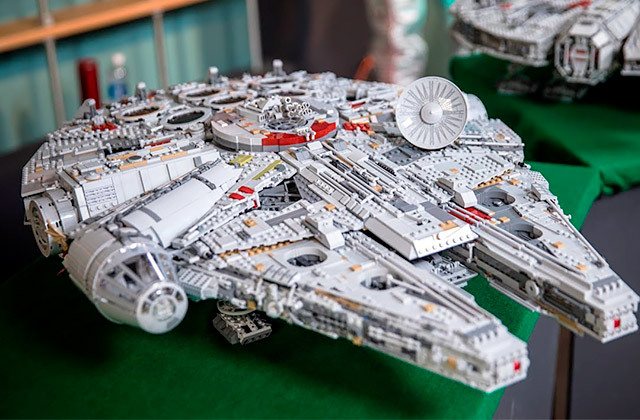 Building Toys Buying Guide, eBay. March 3, 2016. 2. Buying Guide to Toys, Bed Bath & Beyond. 3. Marie Hartwell-Walker, Ed.D. 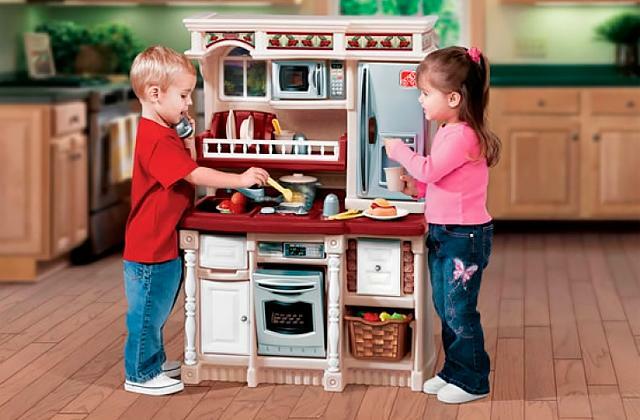 12 Tips for Choosing Toys for Your Child, Psych Central. 4. Toy block, Wikipedia. January 28, 2017. 5. Kim Wallace How your child benefits from play, BabyCenter. October 2015. 6. 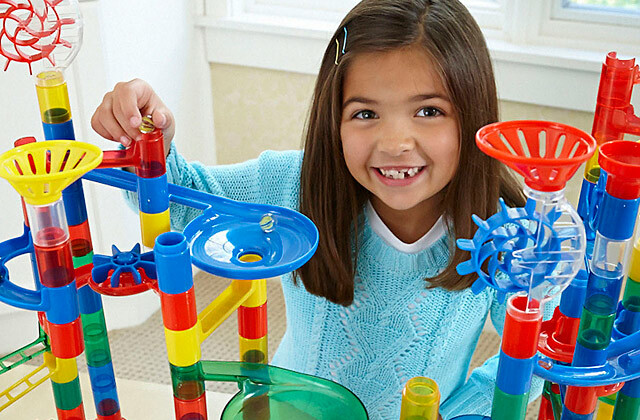 Smart Toys for Every Age, KidsHealth.